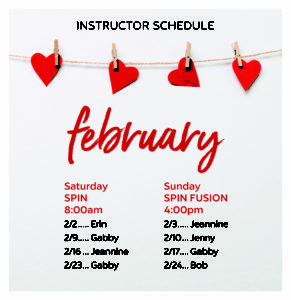 🚨CALLING ANYONE INTERESTED IN SPINNING! 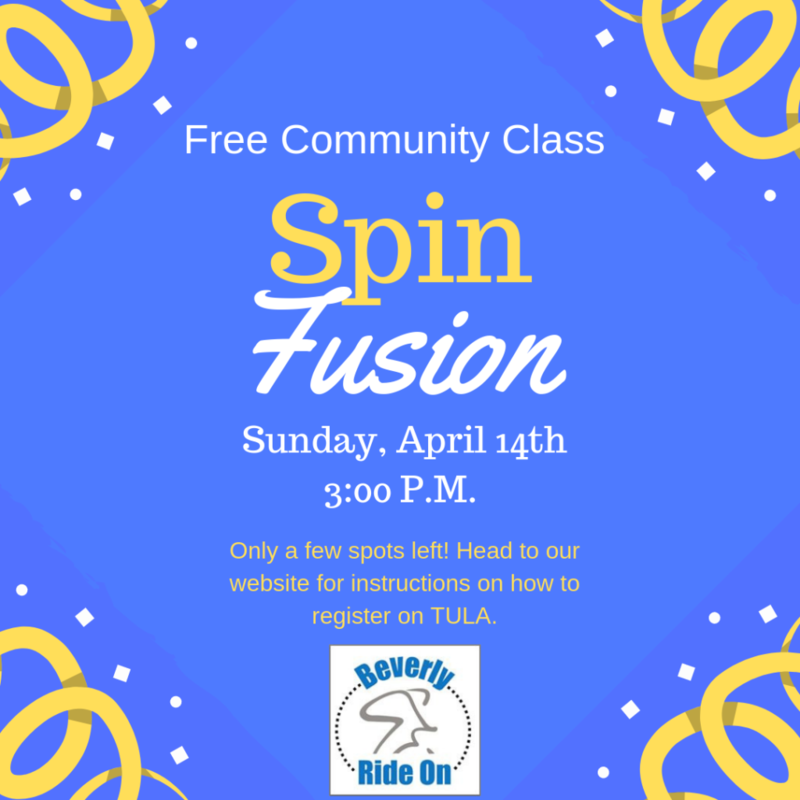 We will be hosting another FREE Community Spin Fusion on Sunday, April 14th at 3:00 p.m. 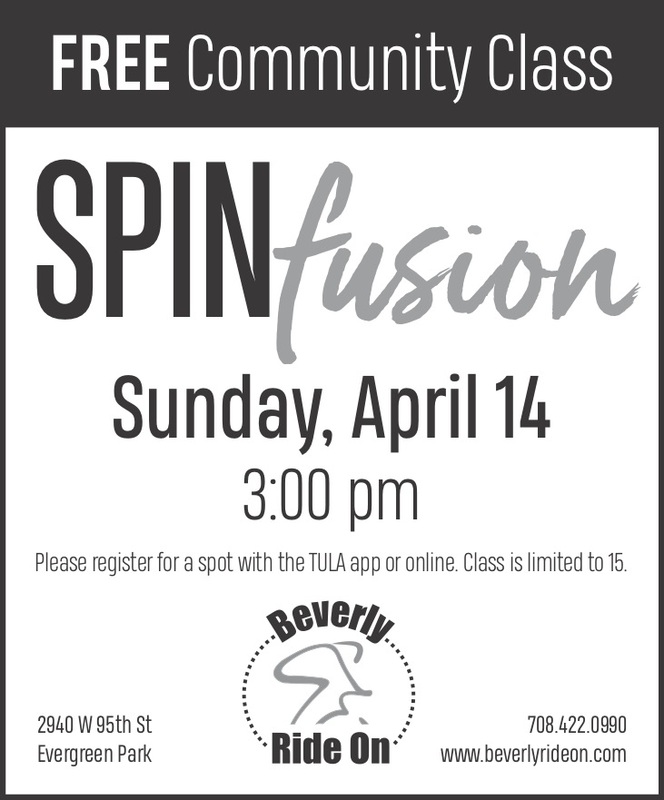 The Spin Fusion consists of 25 minutes of Spin, 25 minutes of abs, back, and arms, and 5 minutes of stretching. Please refer to our website www.beverlyrideon.com to create a TULA account and reserve your spot. Only 15 spots available. Email us at beverlyrideon@gmail.com with any questions! 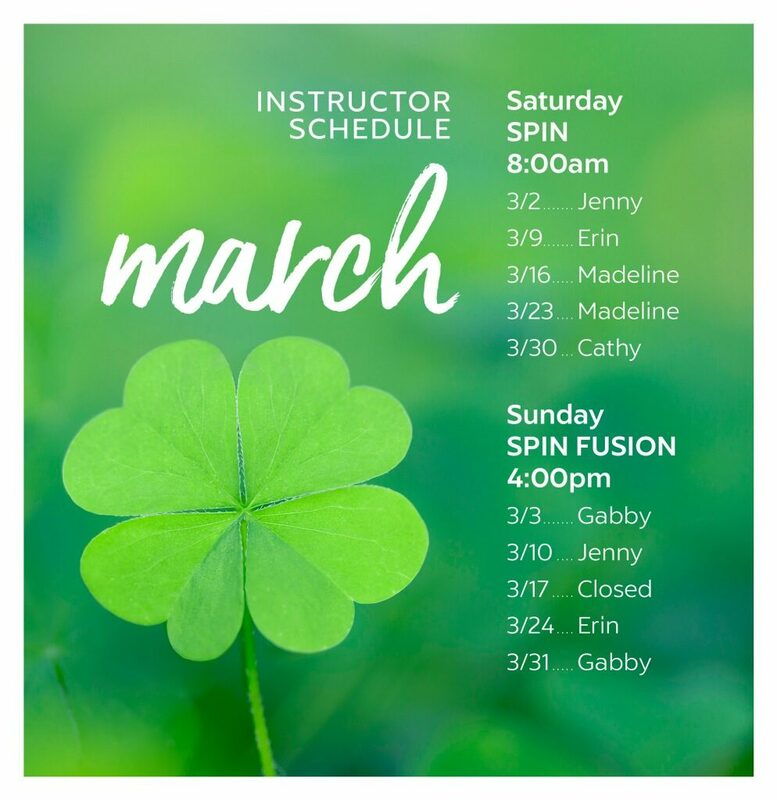 Here is the March Weekend Instructor Schedule! Join us this Saturday, February 9th to support A New Direction Beverly Morgan Park’s Workout to Wipeout Domestic Violence. 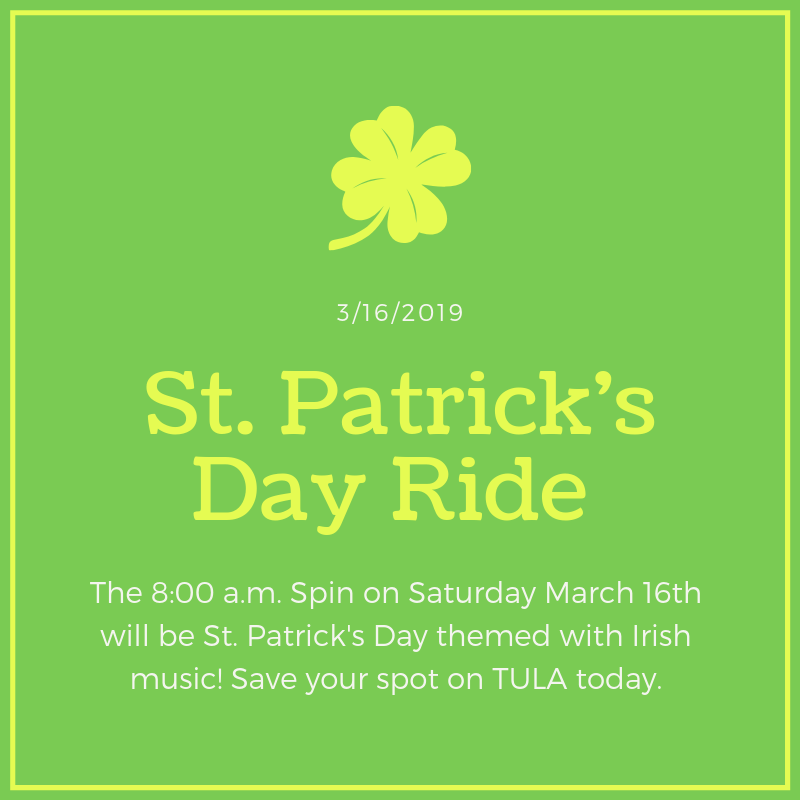 We will be hosting a Spin Fusion with Colleen at 10 a.m. and a threshold ride for Pat Mac’s Pedaling Pac with Bob at 11 a.m.Both classes have a 15 bike limit, so sign up soon at www.anewdirectionbmp.com/wowo and at https://beverlyrideon1.tulasoftware.com/calendar We can’t wait to WOWO and we hope to see you there! Also, check out our friends Core Fitness and Physical Therapy.They will be hosting a Pilates class at 9 a.m.for WOWO! Morning Classes Cancelled on Wednesday, January 30th! Due to cold weather forecasts, the 5:45 a.m. 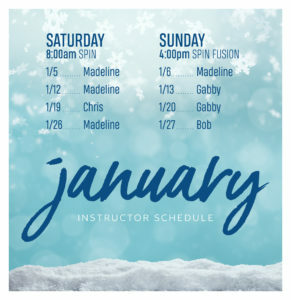 Spin and the 8:30 a.m. 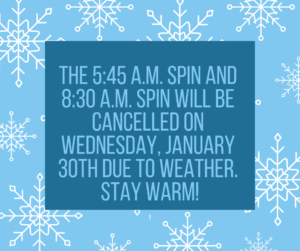 Spin will be cancelled on Wednesday, January 30th. We plan to be at the studio for the 4:30 p.m. 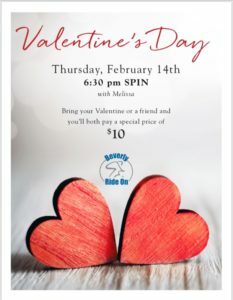 Spin and 6:30 p.m. Spin Fusion. If there are any changes, we will notify you via social media. Stay warm! 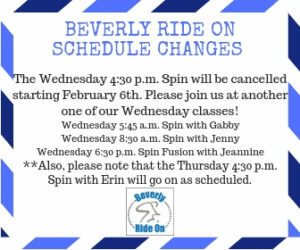 Beverly Ride On Schedule Changes starting in February. The Wednesday 4:30 P.M. Spin will be cancelled. Please join us at another one of our Wednesday classes. Also, please note that the Thursday 4:30 P.M. Spin will continue to start at 4:30 P.M. not 4:00 P.M. Contact us with any questions!